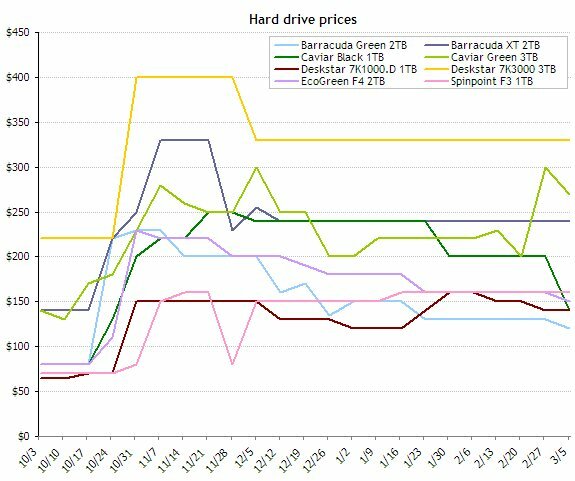 The Tech Report created a chart of the price evolution of eight HDDs on Newegg since the floods in Thailand. The good news is that prices are now declining, but the descent is very slow. Alas, it seems we still have a long way to go before multi-terabyte drives are readily available under $100 again. Prices have fallen slightly since our January update, but most of the cuts have been in the $10-20 range. Of the drives we're tracking, only Western Digital's Caviar Black 1TB is substantially cheaper now than it was in January. WD's Caviar Green 3TB has actually increased in price, briefly hitting $300 before dropping down to $270. A number of other drives have held the line over the past few months, including Hitachi's Desktar 7K3000 3TB, Seagate's Barracuda XT 2TB, and Samsung's Spinpoint F3 1TB.